The first text entitled, ‘Promotion and protection of human rights and the implementation of the 2030 Agenda for Sustainable Development’ (A/HRC/RES/37/24),* was introduced by a core drafting group of 41 States led by Brazil, Denmark, Canada and Chile and supported by 29 others. This resolution establishes a strong connection between the 2030 Agenda and international human rights obligations of States. First, it recognises that the implementation of the SDGs must be “consistent with a state’s obligations under international human rights law.” In other words, the implementation of development plans should not undermine human rights obligations or lead to discrimination or marginalization of vulnerable groups. The resolution concludes that the promotion and protection of human rights and the implementation of the 2030 Agenda are “interrelated and mutually reinforcing.” Indeed, on the one hand, the 2030 Agenda is explicitly “grounded in the Universal Declaration of Human Rights [and] international human rights treaties” (paras. 10 and 19). Moreover, the SDGs “seek to realize the human rights of all” (preamble). On the other hand, the SDGs provide a matrix of targets and indicators essential for measuring progressive realisation of human rights. Second, the resolution notes the important contribution that international human rights mechanisms, including the Human Rights Council itself, Treaty Bodies and Special Procedures, already make in promoting the implementation of the SDGs. For example, in the past four sessions following the adoption of the 2030 Agenda, the Human Rights Council has adopted seven resolutions dedicated to human rights mainstreaming in the implementation of the SDGs. Additional examples can be found in concluding observations of the Treaty Bodies (see, for instance, 2017 CEDAW concluding observations for Thailand, 2017 CMW concluding observations for Jamaica or 2017 CPRD concluding observations for Jordan). Other examples of contributions to advancing the SDGs can be seen in the work of the UN Special Procedures. The SDGs were the focus of several mandate holders that presented reports in June 2017, at the 24th annual meeting of Special Rapporteurs, Independent Experts and Working Groups of the Council’s Special Procedures (A/HRC/37/37). Reports on people of African descent, on the role of equity and inclusion in strengthening the right to education, on contemporary forms of slavery, and recommendations on the business and human rights dimension of sustainable development, all highlighted interlinkages with the Goals. Special Procedures have addressed the implementation of the SDGs in their thematic reports, issued open letters, participated in meetings, and raised matters related to the SDGs during country visits (see para. 40 of the report A/HRC/37/37). Moreover, establishing the link between human rights and the SDGs is one of the current strategic priorities of the Special Procedures mandate holders (see paras. 63 and 69 of the reportA/HRC/37/37). This priority is in line with the current trend relating to strengthening cooperation within the United Nations and enhancing cohesion between mandate holders. SDGs provide an excellent framework for such cooperation. In pursuing this priority, the mandate holders discussed interconnections between human rights, SDGs and resource mobilisation, in particular, the benefits of compiling recommendations, concluding observations, and general comments by Special Procedures and Treaty Bodies relevant to the implementation of SDGs (see report by the International Bar Association’s Human Rights Institute). 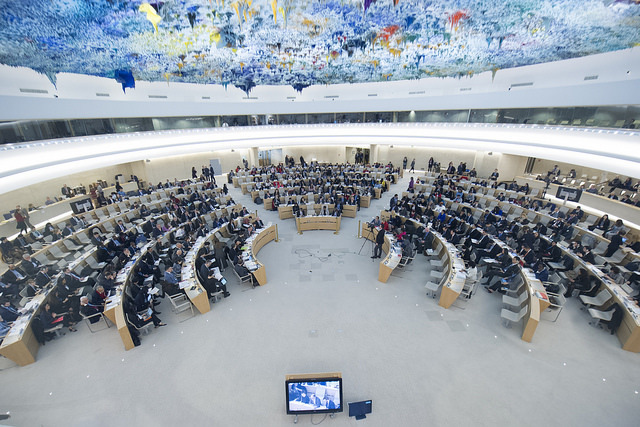 In order to achieve closer coordination between human rights and the 2030 Agenda, the resolution mandates the Office of the High Commissioner for Human Rights (OHCHR) to organise two one-day intersessional meetings for dialogue and cooperation between States, the UN human rights mechanisms and other stakeholders. Importantly for a better coordination within the UN system, such meetings should interact substantively with the annual themes of the UN High-level Political Forum on Sustainable Development (HLPF) and should provide a summary report of the discussions that the HLPF can use in its activities. The first resolution, therefore, has a practical focus and an agreed method of work. The second resolution entitled, ‘The need for an integrated approach to the implementation of the 2030 Agenda for Sustainable Development for the full realization of human rights, focusing holistically on the means of implementation’ (A/HRC/RES/37/25),* was tabled by South Africa and supported by 22 States. This resolution has a clear focus on the right to development, despite the lack of universal recognition of this human right. The resolution recalls the UNGA Declaration on the Right to Development, which recognises that States have “the right and the duty” to introduce development policies aimed at fair distribution of the benefits resulting therefrom. In a similar manner to the first resolution, this text establishes a strong connection between development goals and human rights, with a special focus on gender equality and the empowerment of women and girls. In this context, and also recalling that all goals and targets of the Agenda 2030 are universal, indivisible and interlinked, the resolution expressly reaffirms that the 2030 Agenda ‘is grounded in and seeks to realize human rights and fundamental freedoms for all’. This interpretation has been confirmed by various stakeholders (see, for example,OHCHR and the Danish Institute for Human Rights). As a practical follow-up, the resolution invites the President of the Economic and Social Council (ECOSOC) to brief the Human Rights Council on an annual basis on the work of the HLPF and on the implementation of the 2030 Agenda in an integrated and holistic manner. Dr. Maria Smirnova is a researcher at the University of Manchester. This article first appeared on ISSD SDG Knowledge Hub, and has been reproduced with the author’s kind permission.